It’s old, it’s odd, it’s quirky, it’s a stone’s throw from Disneyland and fits in perfectly with its surroundings. 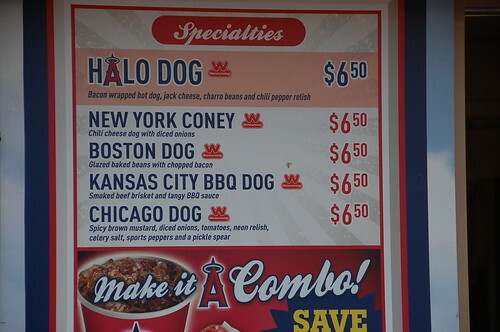 Angel Stadium is definitely one of the most interesting ballparks I have had the pleasure to visit. I was not expecting this of an older park stuck in the middle of a parking lot in Orange County. 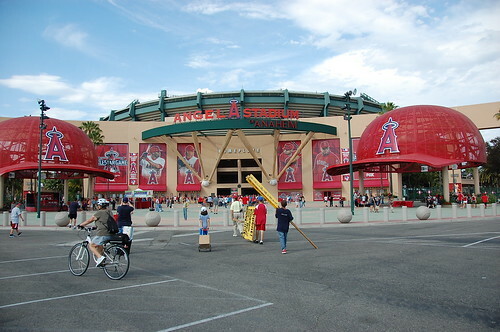 I will always be sad that there was no way to salvage Shea Stadium; I look at what was done to Angel Stadium and sigh. 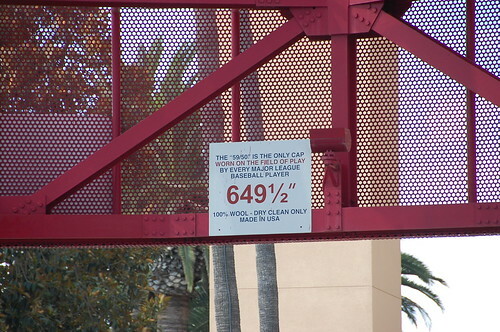 They created additional space by fencing a perimeter around the ballpark, which allowed for outdoor plazas and entrance areas, filled with palm trees, picnic tables and concessions. One of the drawbacks of the older stadium, of course, is that the concourses on the field level are blocked from the field; you have to go up to the 200’s to be able to walk around the park. In many ways it reminded me of Kauffman Stadium in Kansas City, which is a ballpark I happen to love – but it didn’t remind me of the best parts of Kauffman. 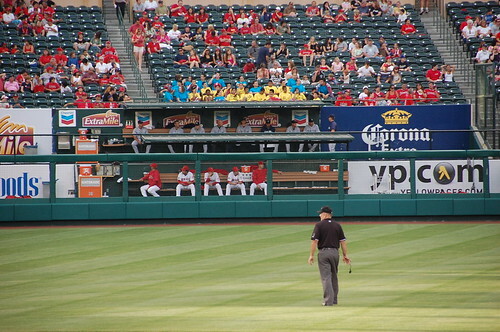 Angel Stadium reminded me of the industrial cinderblock part of that ballpark. Again, tradeoffs. That said, there was a definite effort to enliven the concourses with decals and images of Angels players on every column, so you knew where you were as you walked around. 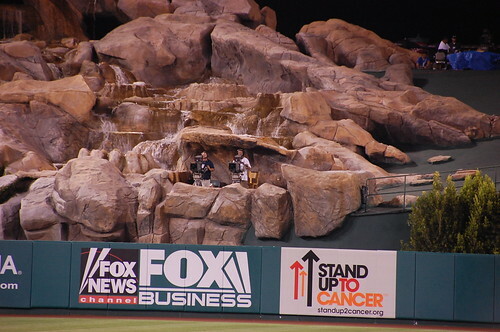 The other thing everyone knows about Angel Stadium is the water feature in center field. It’s different to walk into the park and see it for the first time; it won’t be that straight-on angle you would have seen on television. It always used to remind me of a lion habitat at any zoo; after spending a couple of hours with it, it started to remind me of the fake rocks from Star Trek. I actively disliked the advertising out there; I know the batter’s eye is on the other side of the water feature, but I felt like it was taking things a little too far. I am not sure how well it would age with me as a fan. Maybe at some point you just stop seeing it. I was not overly impressed with the scoreboards, but that could have been my vantage point. We were sitting about 10 rows behind the visitor’s dugout on the first base side, so the scoreboard we used the most was the one in left field. 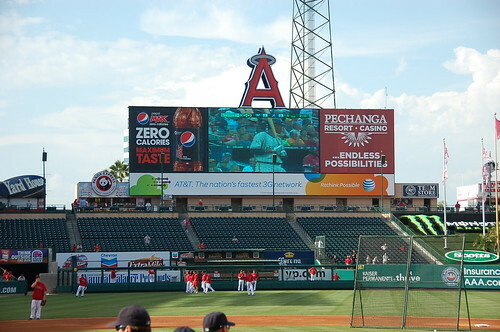 Information like pitch count and speed took some time to track down, and the out-of-town scoreboard was a disaster, as it switched to animated spinning logos between innings, which would be the time during which most fans would be looking to the out-of-town scoreboard. A big fail there. 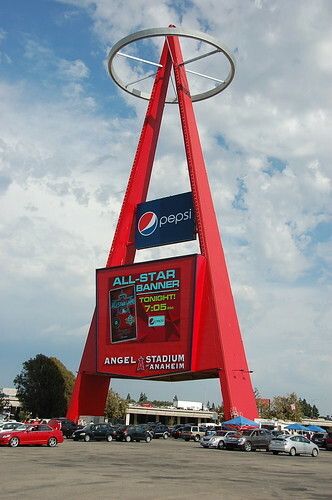 I was also surprised that the only team representation was the dimly lit A on top of the left field scoreboard. There were a lot of ads, but they were limited to white text or two-tone at most, a la Fenway, which makes them less obnoxious. 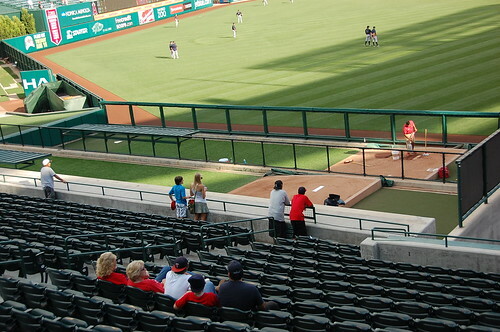 There are split-level bullpens located in left field; however, there is no indicator as to who is warming up at any particular time. On the other hand, we could have missed it, given the scattered placements of critical game information. 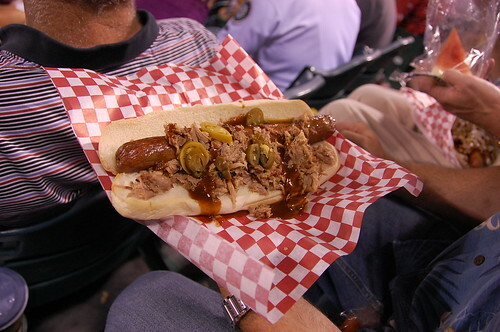 The gentleman seated next to me came back to his seat during the game carrying this delicacy, which he said was called “The Skeeter” (but I hope Angels fans can assist in this regard). There were a lot of different things to eat, and it was easy to find them. I appreciated that greatly. The music was below-average in terms of originality and quality. The lineup is introduced over the intro to “Spirit In The Sky,” which I thought was hysterical. The “let’s get psyched” video was over a song by the detestable Train called “Calling All Angels” which was at least appropriate. The song in the stretch after “Take Me Out To The Ballgame” was “Build Me Up Buttercup”. While I have no issues with the use of Motown generally, it just seemed kind of random here in Southern California. Surely there was something thematic or that could have been chosen. Or perhaps there is a tradition around the song which I am not acquainted with. Fans show up in shirts and jerseys and the ballpark was more than respectably full on a Thursday night. It was hard to gauge fan IQ because we were sitting next to Mariners fans, and in front of two guys who had just moved to the area from North Carolina. People appeared to be paying attention, although they have very little disregard for limiting their movements to inbetween innings or at-bats (despite signage politely asking them to do so). All in all, I found it a fun, comfortable, interesting place to see a ballgame. I would rank it above, say, Nationals Park (believe it or not) because I thought it had far more personality. Of course, all bets are off when the trip is over and I have to redo all of the rankings over again. I think you gave a fair rating of the park and your obsevations were right on. The song in the 7th inning is a puzzle to many of us as well (I even blogged about it during the off season). For what it is – a refurbished stadium, it’s not bad. Sorry I missed you at the park… I’m glad your overall experience was positive. It’s too bad you didn’t get to experience the Rally Monkey and all the things related to him. 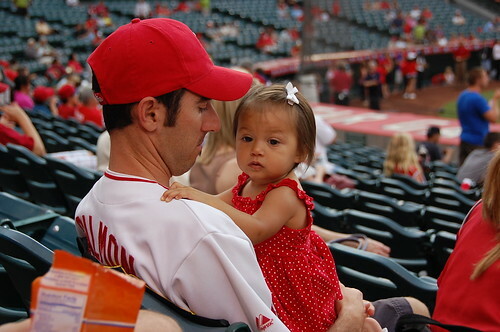 Then again, he only comes out late in games when the Angels a are trailing – so it was a good thing for us Angel fans.